In February 2012, Olga Koumoundouros broke into her neighbour’s abandoned house in east Los Angeles, thinking that she and her partner might squat there while they rented their own home. They were struggling on mortgage payments and feared repossession. 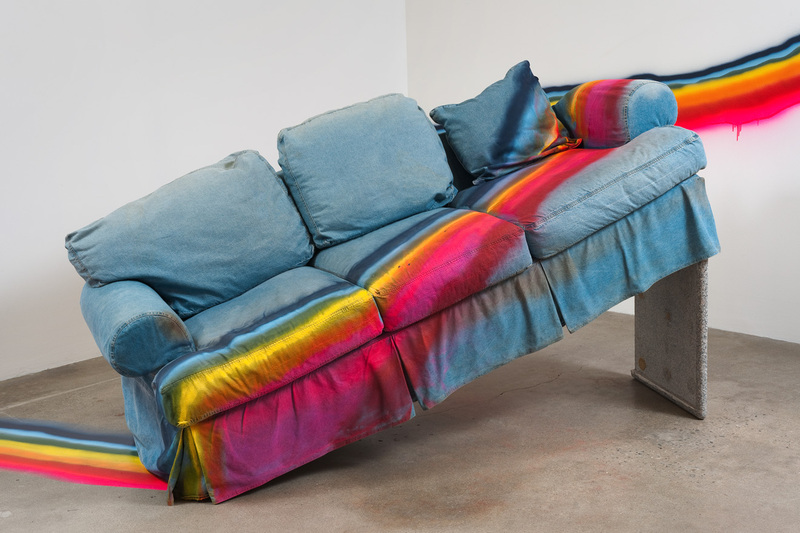 Instead, as she became embroiled in the lives of the house’s former occupants, she made art from their discarded belongings and spray-painted a rainbow that wove across the walls of every room. She painted the outside of the house gold, and titled it Notorious Possession (2012). When the foreclosed property was auctioned in October, Koumoundouros was evicted. Before its new owners – a real estate development company – redecorated the building and sold it for a huge profit, she legally secured the right to retrieve her artworks. In her exhibition Possessed by Glint and Dreams, the gold-painted canvas panels that had previously covered the roof now hang, inverted, from the ceiling, like a colloquial symbol of the house’s fate: ‘flipped’ is a real estate term for a quick and profitable resale; ‘upside down’ is what they call people whose mortgages are worth more than their homes. Notorious Possession was not so much an aesthetic project as an activist statement. Koumoundouros organized performances, discussions, and other events in the gold house, exploiting its visibility to raise awareness of the number of vacant and foreclosed properties in the neighbourhood. Possessed by Glint and Dreams, on the other hand, places its emphasis on the kinds of personal expression that are normally visible inside, rather than outside, the home. The rainbow, for instance, sprayed here across the walls of the gallery, seems less a statement of gay pride (apparently the former occupants were a lesbian couple) and more an expression of mawkish taste, especially as it runs across an overstuffed denim couch that had been left behind in the house. Koumoundouros has titled that monstrous object, propped up at one end by a section of kitchen countertop, Leprechaun Trap (2013). Sun (2013), a gold-painted satellite dish arrayed with fluorescent tubes, and Moon (2013), a silver papier-maché demi-sphere hanging from the ceiling, cast the installation as a shoddy fairy tale. Walking behind the couch, the denim peels apart to reveal a protruding white backside, as if the body and its supposed shelter were one and the same. If that is so, was Koumoundouros’ original intervention into the building a form of life support or a violation? Linda, the previous owner, evidently thought the latter. In an incandescent email reprinted in a book that accompanies the exhibition, she calls the artist an ‘interloper, vandal and squatter’. She has a point. That moral ambiguity is what animates this exhibition. For selfish reasons, Koumoundouros chose to transgress the sanctity of a home (albeit an abandoned one) and appropriate the tattered remnants of someone else’s life in order to talk about issues that are bigger than both herself and Linda.